I think the word "Olympiad" is sadly under-utilised these days. The opening ceremony of the London 2012 Olympic Games are just around the corner: 5 days, 9 hours and 51 minutes away, to be precise. This week through Viridian's Sunday Stamps, we are very-fittingly sharing Olympic themed stamps. I have chosen to share this lovely set of four stamps issued when my own home city hosted the Games of the XVIth Olympiad in 1956. 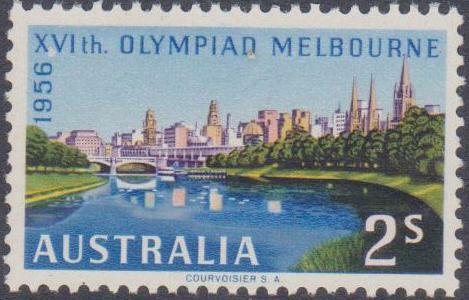 The two coloured stamps present two fairly iconic images of Melbourne. 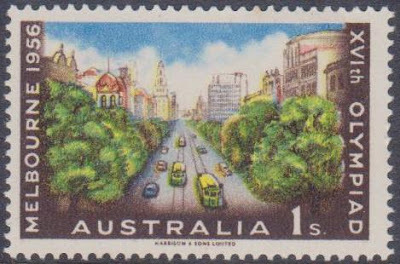 The 1s stamp shows Melbourne's green and yellow trams, which still trundle through our streets today; and the 2s stamp shows the Yarra River, with Flinders Street station in the background. Both scenes have changed somewhat in the intervening 56 years, but both remain identifiable. 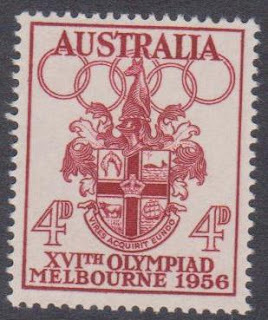 A large part of the reason cities choose to host the Games is to showcase the city's appeal to a worldwide audience, and I think the above two stamps would have been issued with that objective in mind. The last stamp in the series is a monochromatic red stamp that features Melbourne's Coat of Arms. 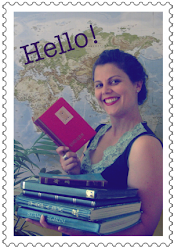 As always, I have once again learnt something through choosing stamps to share. This week I learnt that the City of Melbourne has a Latin motto: Vires Acquirit Eundo. It is apparently a line taken from Virgil's Aeneid and means "We gather strength as we go". I have said it before, and I'll say it again: I love a good Latin motto. And I think perhaps the pomp of a Latin motto sits well with the pomp and ceremony of the Olympic Games, so I will just leave it at that, for today. Oh green and red trams still running, marvellous (I love a tram). Nice combination of motto for games and city. Great stamps from a great city. I couldn't agree more about 'Olympiad'. The middle two stamps look like travel ads. Makes me want to go there. I think the two stamps showing Melbourne do a great job in making it look attractive. The word Olympics has been sullied a bit due to a few scandals.... the word Olympiad remains as regal as ever. The tourist stamps of the 56 Games look very nice. 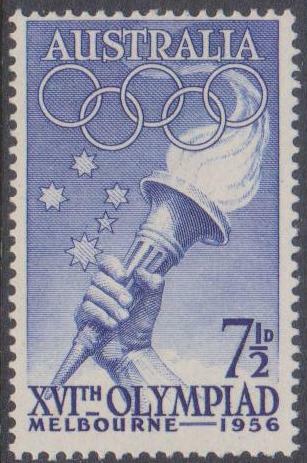 I like that the first stamp also features the Southern Cross. How lovely for a city to still have its public transport system! The 3rd stamp is my favorite!